My background is in the computer industry. On computer forums, complete guides are common. Guides will lay out the specific parts, programs, and steps needed to accomplish a task. I've found guides like this less prevalent in the car world. Build threads are usually the only guides available for an engine swap. Scanning through possibly hundreds of posts to figure out their build is not ideal, and it is likely that many different threads will need to be looked at to gain answers to all possible questions related to the swap. With this guide, I want to give a complete list of parts I used in my L31-R swap. I also want to pass on any useful tips or information that I learned about the swap. NOTE: This guide concerns a stock L31-R swap into a 91 LB9 car. No cam change, no head upgrades, or anything else. What came with the crate engine is what went into my car. 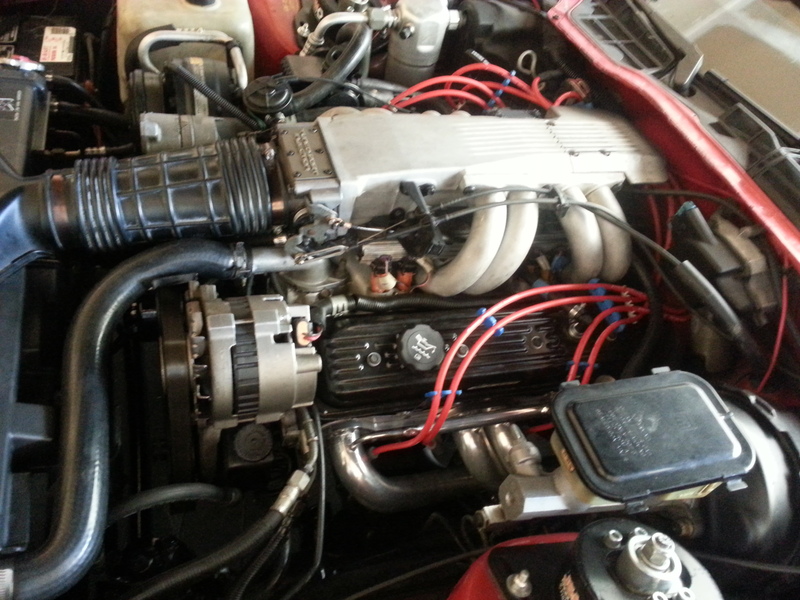 My 700R4 was rebuilt, the TPI system was reused, and all engine accessories were used from my car. This guide will not go into detail about anything that isn't involved in a 91 TPI Camaro swap, eg: TBI cars, two piece rear main seal cars, T5 cars, carbed cars, or MAF cars. Most of the information in this guide will apply to those cars but some tweaks may be required. Two A.I.R. check valves for the A.I.R. tubes on the headers. My old ones broke the threads off of the stock intake manifold due to the age. Vortec heads have a different port configuration when compared to older style SBC heads. A vortec specific intake manifold is required. The intake bolts are also different and cannot be reused. No EGR ports in the vortec heads. It is possible to run EGR by tapping off of the passenger side exhaust manifold/header like the trucks/vans do. I decided to run no EGR. If you need to run EGR for inspection look elsewhere for your swap engine because the L31-R won't pass inspection even with the EGR ran from the exhaust manifold. The coil mounting bracket will need to be modified or relocated due to the new intake manifold height. A bypass line from the intake manifold to the waterpump is required. The internal bypass built into the block on older SBC blocks is not drilled on the L31-R. If you don't run this bypass line there will be no coolant flow before your thermostat opens. This is not desirable for the heads. Run the bypass. The timing cover is different on the L31-R when compared to my stock LB9 timing cover. The L31-R has a plastic timing cover with a different shape and bolt pattern. There is also a hole in the bottom of the timing cover for a cam position sensor used on the OBDII trucks that the L31-R came in stock. That hole needs to be plugged (to be discussed later in the guide). The L31-Rs harmonic balancer is 8 inches in diameter. My LB9 balancer was 7 inches in diameter. Setting the timing can be difficult. In stock applications, the cam position sensor discussed above is used in conjunction with the OBDII computer to set the timing to 0*. Since we don't have that cam position sensor, we have to get a little bit more creative. No need to swap oil pans. The oil pan that comes with the L31-R fits perfectly. The oil filter adapter can be reused from the LB9 without issues. Lets now take a more in depth look at the information posted above. For a speed density car (cars with a MAP sensor), everything listed above is a direct drop in solution. All engine accessories (smog pump, A/C compressor, alternator, water pump, power steering pump) will bolt on with no issues. A.I.R. lines can be ran as well. The intake is fairly straight forward. A vortec specific intake is required, as is vortec specific gaskets and intake bolts. For the TPI, only one company makes a vortec to TPI intake which is the one I've listed in my bill of materials above. If you decide to not run EGR as I did, you will need to create two block off plates. One for the original EGR opening on the top of the intake under the planum, and one for a smaller EGR port specific to the TPI vortec intake that allows for running the truck style exhaust manifold EGR. The EBL P4 Flash computer will also need to be programmed to disable the EGR by setting the EGR enable temperate to the maximum value (this should be disabled by default in the roms that come with the EBL). Exhaust is straight forward as well. Dyno Don headers come with or without A.I.R. tubes. All headers come with an O2 sensor port on the driver side header. I installed the headers on the engine while it was on the engine stand and carefully lowered the engine into the engine bay to ease the installation of the headers. After that, the only thing that is required is fitting the Y Pipe, welding it up once fitted, and installing the rest of the exhaust. NOTE: Make sure you re-install the accessory support braces with the headers. Use two studs off of your stock exhaust manifold and use the provided spacers to re-install the braces. If you do not you may experience engine vibration as I did. Now onto the fun stuff. Because the intake manifold is taller than the stock manifold, the ignition coil must either be moved or the bracket modified. I chose to keep the coil in the stock location on the passenger side of the intake by the firewall. Because the intake manifold is no longer slanted at a 45* angle, you will need to flatten out the bracket into more of an L shape to get it low enough to fit. But is is possible. For the waterpump bypass line, the stock waterpump from my LB9 could be used. I had to remove a bolt from the top of the backside of the water pump to reveal the bypass port. Then I installed some fittings that gave me a 90* L shape off of the bypass port on the waterpump. Then a short piece of coolant hose was ran to a fitting I installed into the front of the intake manifold by the coolant temperature sensor. The manual that comes with the TPI to vortec intake manifold will tell you use to a hole towards the drivers side of the intake (directly under the thermostat) for the waterpump bypass. This will hit the fuel rail lines though, so I plugged this hole instead and used another open hole towards the middle of the intake for my bypass. This solution did not cause me to modify the fuel rail mounting. Look at waterpumps on big block chevy's for an idea of what this looks like since they run bypasses as well. To plug the cam position sensor hole in the bottom of the timing cover you can make something yourself or just buy a pre-made plug. I chose the latter. When you buy the Dorman part #635-505 timing cover it comes with plug and a screw to hold the plug in. For $25 it was nice to have a plug that would for sure stay in with no leaks. It also left me with a spare timing cover if I ever needed to replace mine. Use an adjustable timing light to set your initial timing. Buy some balancer marking tape which will give you timing marks. I used method 1. There is a single indicator on the timing cover and a single line on the balancer. After a little testing, I could fairly positivity say that when the line on the balancer and the indicator on the timing cover lined up, I was at TDC. Using that as 0* of timing, I adjusted the timing under I got 6* BTDC on my adjustable timing light. Not perfect, but it has been running good enough without issues. If you buy Bosch 3 22lb fuel injectors from South Bay Fuel injectors, be aware that they are not actually 22lb injectors. They are 19lb injectors. To set the EBL P4 Flash up correctly, you will need to set the injector flow rate to 19lb, 0 out all fields in the INJ - Small PW Correction - PORT Only table, and set the INJ - Injector Correction Offset table to a specific curve. If you do not do this you will be running lean no matter what you do with your VE learns. See the attached picture for the Injector Correction Offset values I used. When buying parts for your new engine, you have to think about if it is a Camaro part or a L31-R part. Sensors, TPI parts, engine accessories, etc will still require you to look for Camaro parts. 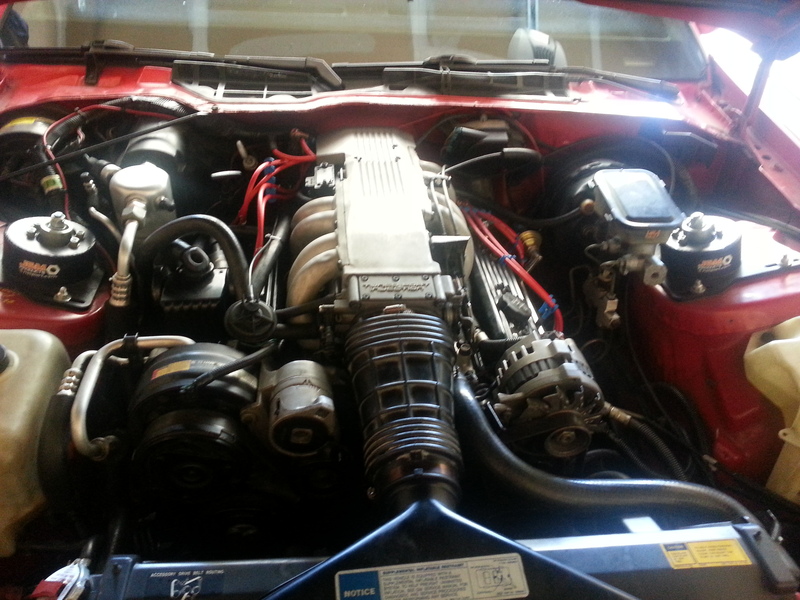 When dealing with a part on the engine itself, search for a 1998 Chevy C2500 with Vin "R". This will give you a truck with the L31-R in it stock. Edit #1: See post #8 for emissions results. Last edited by Dartht33bagger; 11-18-2017 at 05:42 PM. Thanks for the excellent write-up! I am contemplating this setup. I love the look of the TPI plenum and still want to have a chance of passing smog. I found this article in Super Chevy (attached). This combo is potentially good for 458 HP and 585 lb-ft of torque. (article attached). 1. In my area it is not hard to find techs that do not look too closely at the setup. Running an EGR is likely good enough. That being said, do you know if this combo will pass tailpipe emissions? That is the one thing I am concerned about. 2. Since I have an 89 which is a MAF car, I would likely have to change my ECM to MAP one. I am concerned that this could open a can of worms. Any thoughts? 3. Any dyno numbers? Torque must be monstrous. Last edited by Tootie Pang; 06-07-2017 at 03:28 PM. 1. I haven't taken my car through emissions yet. Later this year will be my first time going through emissions with the new engine setup. I can't imagine it won't pass though when my previous motor (barely) did. On my old motor I'd have to mess with the idle screw on the throttle body to kick up the idle to get it to pass. With the new computer I can adjust the idle speed, timing, fuel trim, etc with ease. With a new cat and retaining the A.I.R. system it should be a breeze. 2. You don't have to switch to a MAP computer. Dyanmic EFI makes a computer for the MAF cars that you can use. 3. No dyno numbers but it definitely produces a lot more torque than my 305 ever did! Have it emission tested yet? I assume you don't have a visual inspection test since you deleted the EGR? Thats one thing I'll have to figure out if I go this route. Overall it runs great. It fires right up when cold, has more than enough power, and required relevantly little tuning with the EBL P4 to get it running correctly. The only issue I haven't been able to work out yet is warm starts. If I let the car sit for 30-40 minutes after driving it and try to start it, 75% of the time the engine will stall out if I don't give it some gas until I get in gear. After it is in gear and falls into closed loop the issue goes away. It is a fairly minor problem and I have some possible mechanical causes I am going to look into this winter to see if I can fix it. Emissions testing is coming up soon. My tags expire in January so I expect to get the papers to renew them this month. I will post my results after I go through it. Hopefully I will pass outright without having to make any tweaks! There are minor visual inspections in Oregon. The tester will check that the car has a catalytic converter. No under the hood checks or EVAP testing occurs. A simple idle, up to 2500 rpm, and back to idle test is administered with a probe in the tailpipe. Only hydrocarbons and CO have to be under the 'Pass' levels specified on the sheet I think because in past years with the 305 my NO and CO2 have been above the maximum 'Pass' levels on the sheet. Sounds like a little more fine tuning and you'll have it figured out. Yes, please post your results. I'm sure a few people would be interested. The test sound like the same I'll have to go thru. Would you happen to have any underhood pics you could post? Sometimes a pic is worth a thousand words....or questions. Is the vortec swap worth it over just buying another GEN 1 SBC long block? Does GM even offer a TPI 350 replacement long block? Emissions update for those asking for it. First I want to establish what the Oregon emissions tests are. Visual tests are minimal. Inspectors only look for a gas cap and a catalytic converter. No under the hood inspections are administered. Functional tests are also minimal. For example, no EVAP system testing is administered. The only functional test is the tailpipe sniff done at idle. The sniffer first checks if the exhaust is within the accepted values of emissions required to pass. If the values are not within range, the inspector will ask you to rev the engine to 2500 rpm for 30 seconds to warm the catalytic converter up. Then the inspector will have you drop back down to idle for the second sniffer test. If you fail a second time, then you fail the test, and must circle around for another shot. 1st idle: 374 ppm hydrocarbons -> FAIL, 4.1022% CO -> FAIL, 9.8% CO + CO2 -> PASS. 1st idle: 54 ppm hydrocarbons -> PASS, 0.051% CO -> PASS, 12% CO + CO2 -> PASS. Set your idle as high as possible. Hydrocarbons plummet with higher idles. Warm the car up by driving it around in second gear for 5-10 minutes before going to the testing station. Make sure there is no line at the testing station so you can get the car into the testing bay as quickly as possible. If there is a line, put the car in park and keep the engine rpms in the 2000-2500 rpm range to keep the catalytic converter warm. Since Oregon does not test for Nitrogen Oxide values, I have no idea if I would have passed or not since it is not possible to run EGR with a vortec engine. Last edited by Dartht33bagger; 11-18-2017 at 05:46 PM. I will add some pictures of the engine bay to the original post at the top. As far as I know they do not offer a replacement 350 TPI engine. At least I was never able to find one when I was doing research in spring of 2016. I even spoke with my local chevy dealer and they said no crate engines are offered for these cars. The main problem you will run into is most SBC crate motors on the market are motors with 86 and older style heads. These heads have different intake angles which make it so that the TPI intake manifold will not fit on. I think it is possible with modification to modify the TPI intake to fit, but I wasn't willing to try it and never put much effort into researching it. 86 and older style heads also have perimeter valve cover bolts, which are worse than center valve cover bolts. And many of these motors come with flat tappet cams instead of roller cams that come on the vortec motors. To be fair, a few crate engines exist out there with the 87-96 style heads that came stock on most TPIs, but they are few and far between. For the price, I wasn't overly impressed with most of them since they were meant for the TBI trucks of that era. I considered buying a short block for a while and buying aftermarket 87-96 style heads, but that ended up being more expensive than buying the Vortec motor. In the end, Vortec made the most sense. Roller cam, center bolt valve covers, and the best stock head design to ever come out of GM on the Gen 1 SBC. Unless you lived in a state where you need to be able to retain EGR and therefore have to stick with the 87-96 style heads, I wouldn't consider anything other than a Vortec motor. What an awesome write up ! I was really looking into this swap . Thanks again for taking the time to share your experiences. Of note about the availability of a brand new 350 L98 block. jegs has part number. 809-12530282 listed right next to the L31. Looks like same short block but with regular high swirl center bolt heads. I wonder if this would be a direct bolt in for our L98 cars ? From what I could find the 809-12530282 is the vortec motor intended for 1/2 ton trucks with 2 bolt mains instead of 4 bolt mains. To use the motor with a TPI you would still need to buy the same vortec specific intake manifold. great write-up and topical for me; something that's on the cards for me I think next summer. Thanks for the pics and details on the emissions testing. Looks good. Good job. WHAT are you talking about? Both the SDPC and Edelbrock Vortec TPI intakes have EGR provisions and you can hook a L98 Corvette EGR tube directly to the rear of the intake and plumb it to the header. I had EGR on my old TPI Vortec G20 for the first year or so I ran it, when I swapped to the SLP runners the EGR passageway in the runner as well as the matching plenum had previously been epoxied shut, so I I put a block-off plate in the EGR valves place. The last year I had to pass emissions it passed without EGR. Last edited by Fast355; 11-22-2017 at 08:47 AM. I did mention that this was possible in the write up. Setting up the EGR this way would provide the functionality of EGR, but from what I gather, would not pass visual inspection because it is not using the stock EGR setup. So if you installed the stock EGR in the factory location, then tuned it out but still passed actual tailpipe emissions, would just having the EGR there (even though it was not working due to the Vortec heads) get you through the visual and the sniffer? I don't need the EGR here in NJ since it's an OBD-1 car and exempt from inspection, but it would be nice to know I could still pass if I needed to... In my case I'm also missing my AIR system too thanks to the previous owners, but I was just wondering about the EGR being there being enough to pass if everything else was also in place. I don't live in a state with visual inspections so I am just guessing, but from what I've gathered over the years on here, just putting the EGR there would be not pass visual inspection. Great write up - thanks for sharing with the group. I live in CA, and swapped an L31-R into my G30 van, 1995, run EGR, and passed smog. 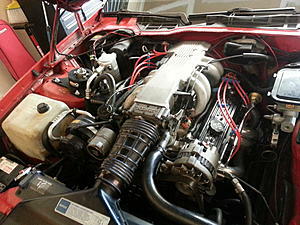 I used CARB legal heads to replace the vortecs, which had the internal EGR routing necessary to pass visual inspection. Summit sells them SUM-162108. I re-sold the vortecs. Smog test required the details on the heads, which they plug into their system. The first time I was given the wrong # sticker from summit, be sure to check this when you get it from them. They quickly sent me the right one. My Brian Harris chip uses 10deg of base timing, however they check this in the inspection (learned this the hard way too). I had to set the base timing to default 0deg to pass. This caused pinging when I didn't change it back immediately (I've confirmed my knock sensor is working, but the ECM couldn't adjust enough to eliminate it apparently). I also used an adjustable timing light to set the timing, and recommend scribing marks on the distributor base to make it easier to repeat w/o using a timing light. The L31-R has the newer SBC timing cover design, which has a port for the crank timing sensor. I used a junkyard sensor and a new o ring to plug this hole. This really threw off the inspector, as they noticed an unplugged sensor. They didn't ask me about it, and it slowed the test considerably (took them about an hour to determine it wasn't necessary). They left it idling the whole time, so everything stayed hot and it is super clean running. It definitely makes more power than the previous stock TBI I had in there which was bored 060 over. Old post, but good info! Anyways, will reusing the L98's distributor on the L31 work? I read somewhere the distro gear's may be different between the L98 and Vortec. Last edited by RowanTheRed; 02-07-2019 at 12:13 PM. It will work fine. Both motors have steel roller cams. Cali is SO crazy strick. I took my BONE STOCK '86 Corvette in for a SMOG and the tester, who I've gone to for years, was concerned because I had wrapped the rotting OE heat insulation, on the stock EGR Feed tube, with aluminium tape! Techs are worried about multi thousand dollar fines and possible Jail time. California is a cancerous commie stronghold, just be glad they haven't rounded up you and yours for re-education.... Yet. My wife and I stay ONLY to not be far from our adult kids!